Microsoft account (one username and password) formerly known as Windows Live ID is the account users used to sign in services such as Outlook. Com, Messenger and SkyDrive, and recently it apply to the latest version of Microsoft OS Windows 8 (allowing users to log into their PC with Microsoft account and password). As the widely use of Microsoft account, the security of Microsoft account becomes more and more important. Microsoft now introduced a two-step verification process to protect Microsoft Accounts and make users' information more secure. "With this release you can choose to protect your entire account with two-step verification, regardless of what service (or device) you are using with your Microsoft account. It's your choice whether you want to enable this, but for those of you that are looking for ways to add additional security to your account, we've worked hard to make set-up really easy." The optional security measure is poised to prevent hacks, fraudulent activities, and account abuses. It will implement verification on all the products and services that use a Microsoft Account, like Windows, Windows Phone, Xbox, Outlook, Skype, and SkyDrive. According to Microsoft, this two-step verification will ask for two pieces of information any time users access their account: a password and a code sent to your phone or inbox. Smartphone users can set up an authenticator application that sends them verification codes while offline. The security update works anywhere you use your Microsoft account – on Windows 8, Web browsers, and Microsoft apps and services on iOS and Android devices. Now we will take an example to explain how this two-step verification works. Microsoft Account user who wants to sign into Outlook.com with two-step verification turned on will have to enter their Account name and password first. The user will then receive a notification from their authenticator app on their smartphone with a secret code. This code is the final key to unlock the service. Unless a potential thief has a user's computer, smartphone and passwords, it's likely they won't be able to break into the Account. Though using the two-step verification is secure for your Microsoft account, it will make it more difficult to access your Account, which could be troublesome for someone who needs constant in and out access. So creating strong password for your Microsoft account is still an effective way to secure your Microsoft account but has the potential risk of forgetting password. 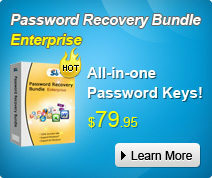 In this occasion, you can use SmartKey Password Recovery Bundle, it can instantly recover lost password for Windows 8 (7/XP/Vista as well), Outlook (Microsoft account password), IE Browser, etc.